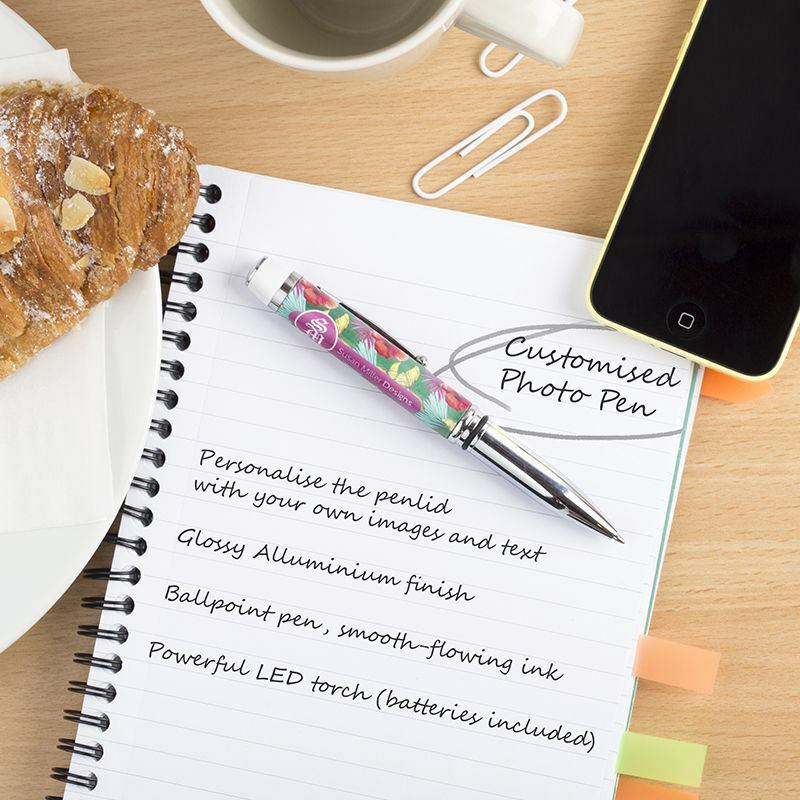 Our personalised printed pen torch makes a stylish addition to any desk, pocket or bag. Chic and highly polished, our Customised Photo Pen Torch is solid, German made and writes flawlessly. Featuring a quality ballpoint and a bright LED light. Personalise your printed photo pen with a photo or design and add text, name or phrase and the torch comes free. Fun and handy gift, that comes in a clear gift tube pack for added presentation value. No minimums. Is it pen, or is it a torch? We call it a pen first and foremost as that is what we need most, but the additional benefit of a built-in torch is fantastic. Super handy when struggling to find keyholes at night, or things inside handbags. One idea for a concert; instead of using a lighter to make a crowd light display, use our pen torch. Third time I've ordered. Always have to buy more than one item as there's so much choice and they're all so thoughtful. This time ordered glasses case with cloth and a torch pen. My dad absolutely loved them from the kids for father's day. I recently ordered a large personalised photo tray and three personalised photo pen torches from Bags of Love, and I have been very pleased with the quality of these items, which were all delivered very quickly after I'd ordered them. I've been extremely happy to be able to give these items as presents, and the recipients have been delighted with them. Thank you! A beautiful personalised pen that also features an LED torch, for a truly multi-functional as well as personal gift. Design your own personalised printed pen as a quirky, fun gift and benefit from the added bonus of a built-in torch. The highly efficient LED bulb runs using just a single LR41 battery. LED torches don't get hot, which makes this perfect not only for adults but for children as well. The high-quality German ballpoint writes smoothly, and the pen torch is supplied in a translucent cylinder presentation tube, with black stopper ends. Spares: cartridges of blue or blank ink are available and the button cell battery for LED pen light is included but also can be obtained from retailers - if in doubt ask us. Your pen torch is made using deep infusion digital printing, which our technicians use to bond the inks to the material of your personalised printed pen. Once the components are printed and ready, our craftsmen assemble your pen torch, from the ink tube to the torch battery. Once complete your pen torch is quality checked by our experts to ensure everything is done to our expected high standards before being sent out to you. The personalised printed pen is a wonderfully simple but ever useful gift. It can be used for such a variety of occasions from a graduation, or great exam results to a leaving gift for a colleague. As the space that you have on the customised pen torch is limited, it is advisable to use a photo with only one subject. Another great design idea is to use our text tool to create a unique and meaningful personalised message.